The News Page lets you post a series of News stories and have them automatically formatted neatly and organised chronologically. In addition the page will automaticlaly archive older stories so that your News page doesn't get too long, but older stories are still retained for users and search engines. Once logged in, and on your site's News page, you'll see the usual blue editing panel at thge top of the page. As well as the usual Edit Page Text and Edit Page Properties buttons, there is an 'Add Story' button. 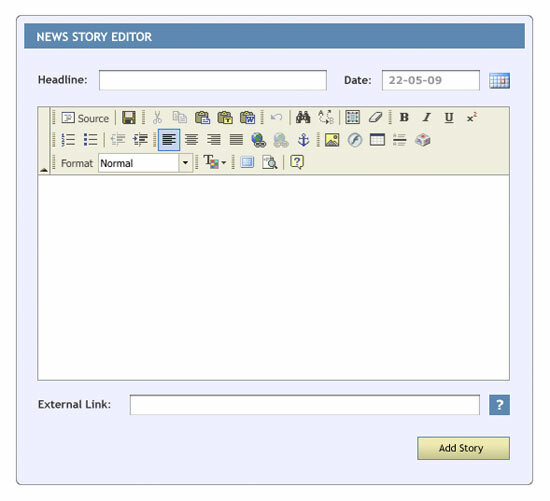 1) Click on the 'Add Story' button to view a new form which allows you to add and edit a new story. 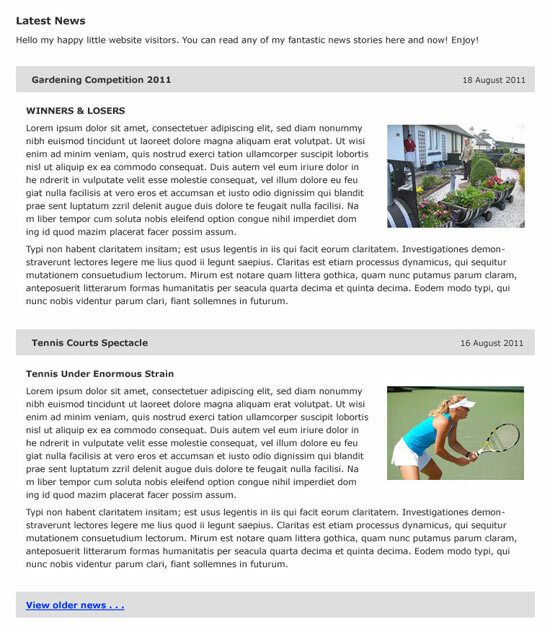 4) Type or paste your story into the foem provided. You can also add an external link to another site if your user can find useful information there. 5) Then clcik on the 'Add Story' to publish it live on your site. TIP:- if you choose a future date from the date picker then your story will automatically appear on your News page on that date. This can be very useful if, for instance, you are going away on holiday and would like your site to look freshly updated whilst you are away. You can set up sveral stories to be published on different days, making you site more attractive to users and search engines while you are away. Here's how your finished stories could look on your page . . . Note that if you have older stories which have been automatically archived to a separate page, then a link will be added by the system to the bottom of the current news page so that users have access to these too. You have control over how old stories must be befor they are archived, and can configure this by clicking on the News Page's 'Page Properties button.